Corn Lollipops - Corn on a Stick! Corn Lollipops - Corn on a Stick! 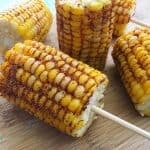 Corn Lollipops – Corn on a Stick! Peel the husk off your corn and boil for 8 minutes. Cut your corn into thirds and stick a wooden skewer into the bottom. Brush with olive oil or butter. Sprinkle your taco seasoning onto the corn.